One of the problems that many computer users experience after a computer virus attack are changes to the system cause by the malicious software. This can for instance mean that system tools like the control panel or task manager do not open, that security permissions have changed, services or startup items have been added or modified or that processes run in the background that have been loaded by the virus. It is sometimes impossible to fix the damage done to the system which means that in those cases only backups or new installations are an option. But most changes are not as severe. They can be fixed either by the antivirus software cleaning the malicious program or by a third party tool like Virus Effect Remover. We have reviewed Virus Effect Remover in the past but it has evolved since then which is reason enough to take a new look at it. The software is a specialized tool which becomes apparent after startup. There are lots of buttons and information displayed in the main interface from access to tools in the left sidebar to a tab driven interface that displays a processes tree and links to various tools that can be used to check and repair specific system settings, files and features. The tools on this page allow a user for instance to scan services, startup locations, check system files, show suspicious files, generate a process list and about a dozens of others. And that only from the main tab. 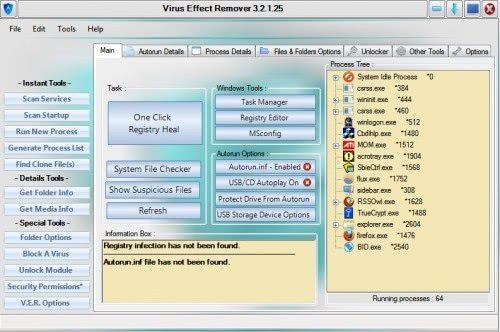 Virus Effect Remover links to various Microsoft Windows system tools like the Registry Editor, Group Policy Editor or MSConfig. The program provides the user with many useful information about the operating system and controls to repair some of the damage that has been done by a computer virus. This looks like a clever tool. I’m guessing it uses those custom widgets to safeguard against using possibly infected Windows DLL’s. One for the toolbox I think. Keeping your computer safe has frequently been an issue although getting more shocking all the time. I have certainly not noticed so much unsolicited mail in my inbox, so many infections and also adware making the effort to interfere with my pc. How are we supposed to comprehend which software programs are the very best? can this be used as live cd? We are helping everyone since Last 16 months ..
but for some reason , our projects are removed from sourceforge …. so please help us by your precious ideas and appreciation ..
to download our products ….